Nestled into an older part of Cleveland’s China Town, on Rockwell Avenue just East of 21st Street (in a location that, oddly, my Apple Maps insisted was a high school), taking up roughly a third of a nicely renovated brick building with Chinese-styled trim that obviously (from the various permits in the windows) will soon be filled with two or three other dining establishments as well. Walking inside, the place was oddly quiet for a Friday at noon, but we soon found ourselves welcomed and seated in a spacious dining room. 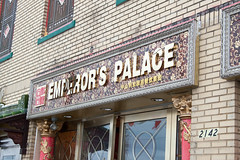 Which is where I’ll make my first general comment about Emperor’s Palace; the name is the exact sort of name that countless generic Chinese-American restaurants use, usually in front of a place with some tacky dragons, red placements, and furniture that looks like it was misplaced from an office supply warehouse. But here in Cleveland’s Emperor’s Palace, the decor actually looked vaguely like… an Emperor’s Palace, with a richly-decorated interior with many large dining tables, lots of ornate gold trim, mirrors, and smartly-dressed waitstaff humming around between tables. 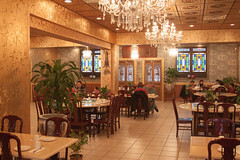 After getting seated, one of the waitstaff came over and pleasantly explained the menu to us, suggesting that the house specialty was dim sum, but that we wouldn’t be seeing dim sum carts circulating around, since Emperor’s Palace does all of their dim sum to order in the kitchen. A small part of me was disappointed since once aspect I generally like about dim sum is the instant gratification of grabbing something off of the cart, but realistically, aside from a few minutes’ wait for most items, this is really for the best: I don’t have to hope that the item I’m waiting for comes by on the cart, and I also don’t have to wonder about the freshness of the food. Once we had a chance to look over the menu, several of my favorite dim sum items were available, and we placed our first order of Hom Sui Gok, Spare Ribs with Black Bean Sauce, as well as a side of Gai Lan (Chinese Broccoli). Starting out with the Hom Sui Gok, I’ve always liked these. Also known as Glutinous Rice Dumplings, these are large, football-shaped glutinous rice flour dumplings wrapped around a pork filling that puff up during cooking. 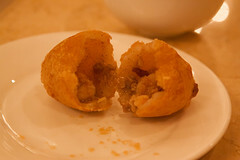 The result is a crispy, hollow, and slightly sweet dumpling around a rich pork filling. And these were a particularly good example of Hom Sui Gok, especially since these arrived fresh from the kitchen at an almost nuclear temperature. 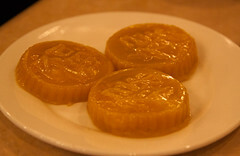 Once they cooled, however, these were the perfect start to our dim sum lunch. Next up were the spare ribs with black bean sauce. Nice, rich little slabs of rib meat with a reasonably good but subtle black bean sauce, these were tender and flavorful. The meat here was simmered to perfection, and the black bean sauce complemented the flavors of the pork instead of covering it. 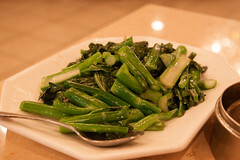 As far as the Gai Lan? We ordered this up with the ginger sauce, and it came out as a large platter of perfectly stir-fried gai lain in a surprisingly rich ginger sauce, very light on the oil. This worked well, usually when I order this (or the related dish in oyster sauce), it’s fairly heavy, but this was a nice, light way to add some vegetables to our meal. Pork and shrimp Tofu Skin Rolls, and sticky rice with sausage and pork. First up, the pan-fried dumplings. 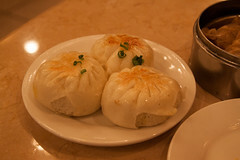 I always like a good dim-sum style pork bun, and these were a nice pan-fried variation on that, with a rich pork filling, a nice bread layer, and then a nice crispiness on the outside. 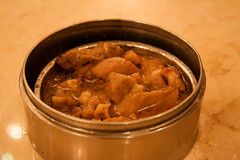 A pleasant alternative to the usual steamed buns I do when doing dim sum. The tofu skin rolls are usually the sort of dish that I love when done well, but usually avoid because it isn’t. 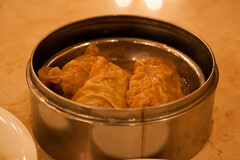 But Emperor’s Palace did a great job with these: nice flavorful and tender tofu wrappers wrapped around a nice pork and shrimp filling, with both the filling and wrapper absorbing some of the oyster sauce they are served in. Finally, the sticky rice. 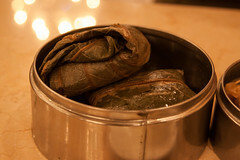 Always one of my dim sum favorite, these were perfect: tender rice with the grains just starting to meld together, some good Chinese sausage and shrimp, and the whole mess of it starting to absorb the flavors of the lotus leaf wrapper. Again, a solid performer. Except that wasn’t all. When the head waitress saw yours truly in my standard Offbeat Eats pose (also known as “staring through the viewfinder of a honkin’ big digital SLR camera at a plate of food while others at the table wait patiently for me to take the damn photo), she immediately insisted that I let her bring out some of their pumpkin cakes, since they were both a house specialty and particularly photogenic. And sure enough, about two minutes later I was staring at a fairly nice trio of pumpkin cakes. These were pleasant dumplings: not too overly sweet, these had a nice soft but slightly starchy texture, a pleasant pumpkin flavor, and just a little hint of spice. Bordering almost on a thick custard, I rather liked these, even though I’ve never had anything quite like them as dim sum before aside from a few sweet taro cakes. These were a pleasant addition to the overall selection we had made on our own. Overall, Emperor’s Palace does an outstanding job with Dim Sum, even better than most of the places I’ve found in the Northeast. Everything is going smoothly here as well, the staff is friendly, the food is good, the prices reasonable, and the portions plentiful but not excessive. I’m looking forward to a return trip next time I swing through town. In case you were wondering, the characters imprinted on the Pumpkin Cakes mean “FU” — ‘happiness’ or ‘joy’ or ‘good luck’. Looks like you found them all at Emperor’s Palace!